Funny way to peal off the eggshell by blowing it through two holes. Unusual way to eat eggs! Dissolving the eggshell by soaking it into vinegar to get a naked bouncy egg. Is it possible to balance a chicken egg vertically? 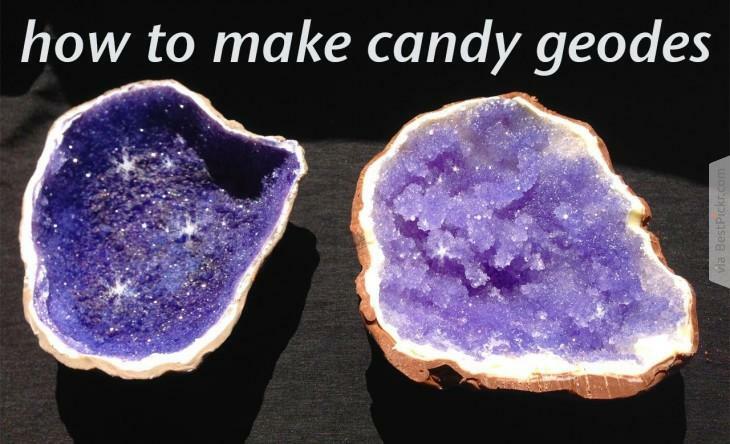 Did you ever imagine cooking candy that look like a cluster of purple Amethyst crystals? This is an unusual and totally awesome gift idea to surprise your loved one or used for party decoration in spiritual rituals, magic parties and meditation classes. Warm sugar in water until you get supersaturated sugary liquid. Then add come food coloring until you get the desired shade. Take grey fondant and add some chunks of darker colors to it. Mix them roughly to get different variations in colors. Then roll it out to a very thin thickness. PS. above method uses fondant icing (often used in cakes), you can also make these delicious candy edible science experiment with candy milk or white chocolate with cocoa powder. 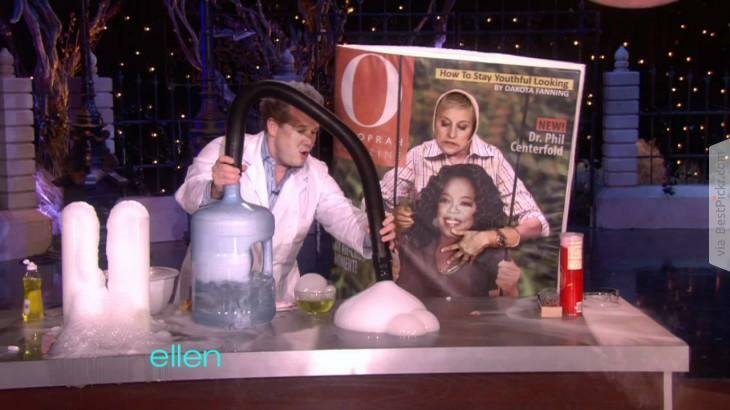 Steve Spangler shows us how to have lots of fun with cornstarch on Ellen show. Did you know that corn starch when mixed with water can become extremely solid under sudden pressure? ...and it will even bounce back when you punch? This is an amazing idea for kids birthday party, middle school children will love it! And so much fun even for adults too! These are some really cool science experiments you can do at home with kids, great for Christmas, Halloween or other holiday party ideas. Steves shows us how to use dry ice and hot water in cylinders with dish soap to create awesome gassy smoke bubbles that you can safely touch. Turn your living room into magical wonderland with these mystical white smokes from dry ice, perfect for many party occasions. Or how about making your bottle of Pringle chips explode with hydrogen and oxygen burning inside? All you need is a balloon filled with hydrogen gas and drill a hole in the Pringles bottle. Then fire it up... and wait for the surprise! The potato chips are even edible after the experiment! Lastly, a crazy Halloween experiment with carved pumpkin using hydrogen peroxide mixed with soap. Watch the pumkin explosion with smoky purple throw up. 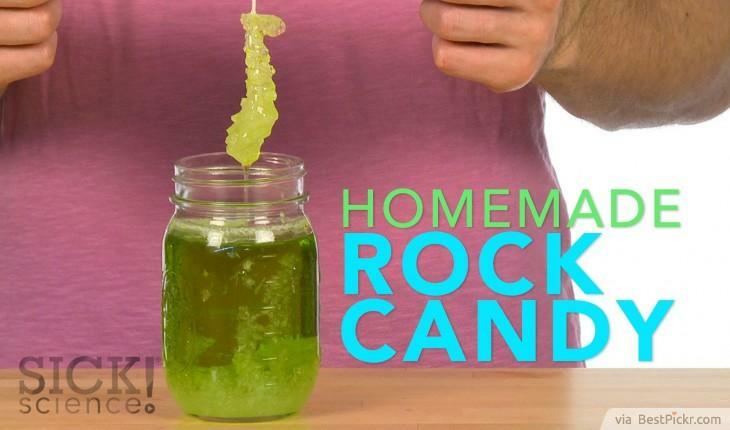 In this fun and yummy science experiment, you'll learn how to make an edible candy crystal forming around a string, a perfect diy project for holiday celebration to decorate Christmas trees with real sweets you can eat! Note: adult supervision is recommended. Soak the dry string into the solution again and leave it there for at least 1 week. Pull it out and watch miracle happen as the sugary liquid crystallize around the string! Put marshmallows into microwave for about 30 seconds and watch them explode. Just be careful not to touch the marshmallows, because it's very hot. 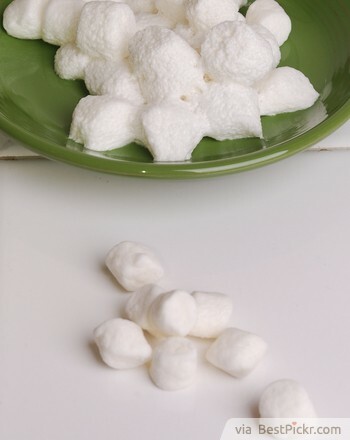 Marshmallows, just like popcorns, have tiny water droplets trapped inside. They create tiny bubbles of moist air that when heated expand very quickly, building up pressure inside marshmallow and making them grow really big.